There is a reason we call these “projects.” They are experiments and not every time do you produce a resounding success like pumpkin caramel whoopie pies. During my time living in and writing about the Los Angeles food scene, every Autumn I would be as excited for Thanksgiving as I would be for the annual trip I would take to the Monastery of the Angels in the Hollywood Hills for their beloved pumpkin bread. 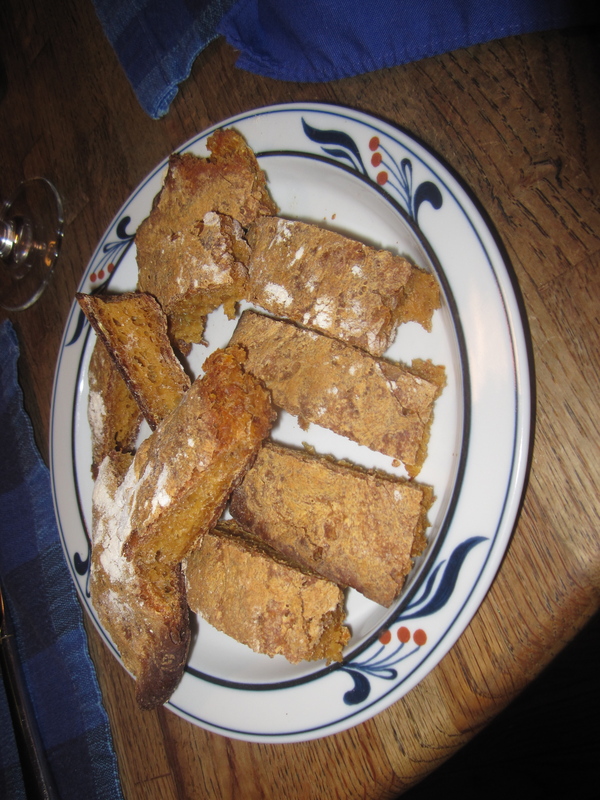 The bread achieved that perfect balance of clove and cinnamon spices, where savory meets slightly sweet. It could be at home alone as dessert or alone in the bread basket during dinner. Visions of this pumpkin bread in my head got me thinking about potential savory pumpkin bread candidates to join the usual olive bread on our Thanksgiving table this year. Unfortunately the project had its flaws, most likely keeping it away from the table next Thursday.This pumpkin rosemary bread from Food 52 seemed like a terrific recipe for a slightly baguette-like bread with a soft, almost doughy interior, and a good crisp crust. Yes, I made some tweaks to simplify the recipe, including going with all bread flour, instead of the requested half bread flour, half Italian 00 flour. 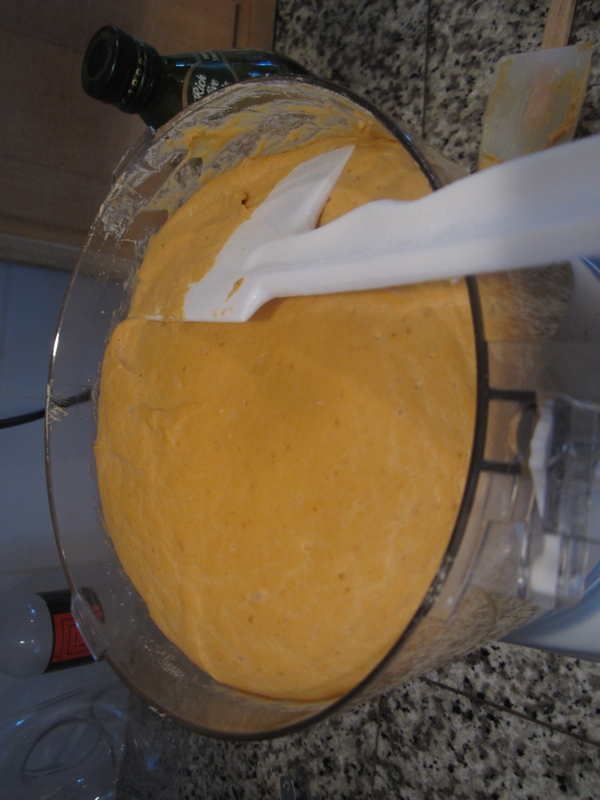 After making the Biga (yeast mixture), you mix the canned pumpkin with the Biga for an initial runny, wet muxture. No problems here or anywhere during the rest of the prep process. It’s really quite simple really, mixing in molasses and then the flour leading to a very stiff dough. The bread knead beater in my mixer was overwhelmed by the dough’s strength, so I had to switch midway to the food processor’s bread kneading component. Make sure not to skimp on the finely chopped fresh rosemary and the kosher salt. They are the two real flavor lifelines for the bread. In fact, more than a sprig of rosemary would be desired by me to replace the spot usually occupied by cinnamon and cloves for a pumpkin bread..
It’s not the flavoring that was the downfall of this project, though more pumpkin to shine through would be appreciated. It’s the structure. Maybe something went awry when splitting the prepared dough in two on the baking sheet like two hefty baguettes. Lots of time is needed for the various rises, including the crucial last one covered by a towel on the baking sheet for 2-3 hours. This is a delicate bread that really needs its time to breathe and grow. The recipe calls for the bread to bake for 50 minutes at 425 degrees. Yet, by half that time, the exterior was already showing signs of being charred and the sound certainly hollow like you look for from a baguette. Meanwhile, the interior was as raw as tartare. It remained still a bit too doughy, lacking any fluff, even at the 45 minute mark when the bread looked as if it had spent a good amount of time on the barbeque, and I had to pull it out. Maybe it was the lack of 00 flour? Maybe the baking temperature is too intense? Maybe there needs to be more pumpkin or some baking soda added in the dry mixture? 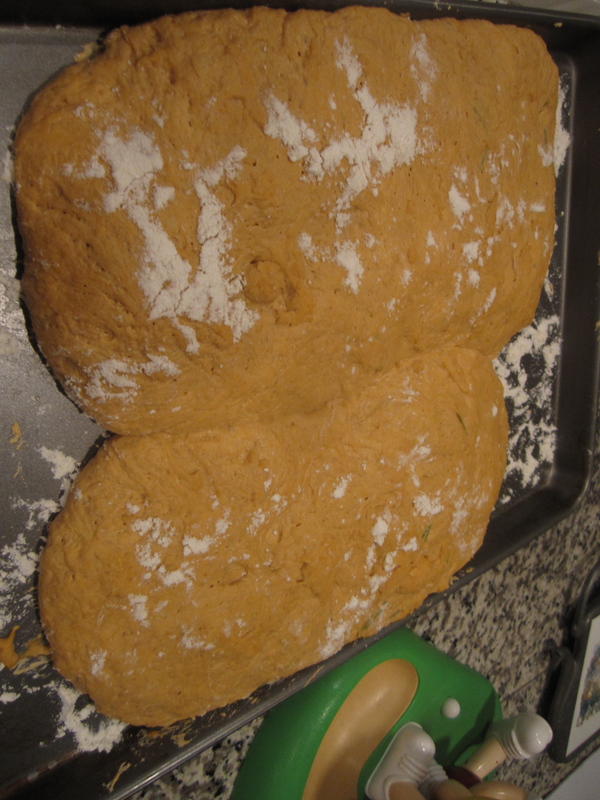 Maybe there is a way to keep the two loaves from flattening out in the final rise, like using a baguette pan? Unfortunately, this pumpkin bread can’t replace the special one from the nuns in Los Angeles. It’s a very promising recipe. We won’t give up on it. Projects are meant for exploration and there is certainly the potential here for a future Thanksgiving addition. This entry was posted on November 14, 2012 by trevsbistro. It was filed under Tuesday Project .